Prehistoric field systems are, by their nature, extensive and often slight and intangible structures, most easily recognized when they are enclosed by walled, banked or ditched boundaries. The effects of many centuries of subsequent land use mean that many have been destroyed and those that remain complete and unmodified are of great archaeological value. This is the case even in north-west Wales, despite the presence there of many well-preserved examples of prehistoric settlement. These settlements have been the subject of numerous investigations but little is known about the types of agricultural activities that accompanied them. 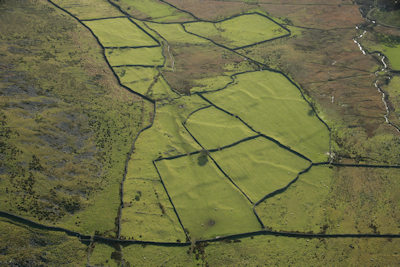 The present study was therefore designed to correct this imbalance by investigation of three examples of early field systems in north-west Wales. The methods used included ground survey, geophysical survey, excavation, palaeoenvironmental analysis and soil micromorphology.